The puff stitch is one of the cluster stitches, similar to a bobble and a popcorn stitch. Several stitches are worked as a cluster within the same stitch without changing the stitch count of the row. The puff stitch is "puffier" than the bobble or popcorn stitch and can be worked in rows or in conjunction with other stitches. Chain an even number of stitches until the desired width is obtained. Chain two and turn. Work one double crochet in the third chain from the hook. Chain one. Skip one chain. Yarnover and pull a loop through the next chain. You will have three loops on the hook. Yarnover and pull another loop through the same chain (now you have five loops on the hook). Yarnover and pull another loop through the same chain for a total of seven loops on the hook. Yarnover and pull a loop through all seven loops. Chain one. Repeat until you each the last chain. Work one double crochet in the final chain. Chain two and turn. 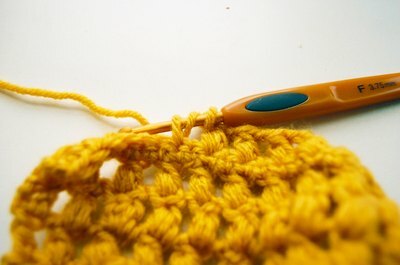 Work a double crochet in the third stitch from the hook. Chain one. Work a puff stitch in the next stitch. Continue working a puff followed by a chain and beginning and ending a row with a double crochet for the entirety of the swatch. This would make a lovely blanket. 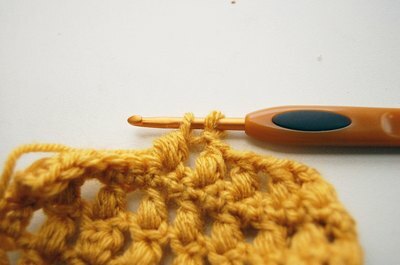 Use your swatch to determine the size of your blanket. For example, if you measure 5 stitches within an inch and you want a blanket 30 inches wide, multiply five by 30 and chain 150 stitches. 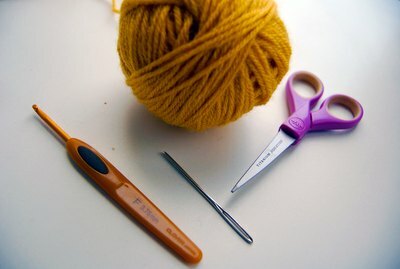 If you have 4 stitches to the inch, then you would chain only 120 stitches.